Buffalo Range Shooting Park has 7 total trap shooting lanes each with its own pull string clay thrower. If for any reason you have any questions or comments about trap shooting in Ottawa, feel free to give us a call at 815-433-2471 or fill out the form to the right and a representative will respond shortly. Our throwers are capable of launching multiple clay targets at a time. Some shooters want to increase the challenge and load two or more on the thrower to really hone in on their shooting skills while trap shooting in Ottawa. Shooters can operate the thrower themselves but it is a better experience to have a friend or family member to set up and throw the clays while trap shooting in Ottawa. Using this method will allow the shooter the ability to focus on the shot after yelling “pull” to their helper. Our private shotgun lessons in Ottawa are a great way to brush up on your skills. Advanced shooters may want the helper to surprise them with the pull so it is not anticipated. This will help shooters hone their skills, as fast reflexes and quick target acquisition are a must while trap shooting in Ottawa. 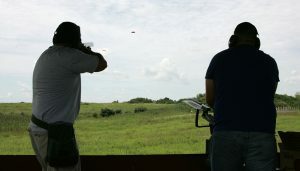 Buffalo Range Shooting Park has trap shooting in Ottawa that is very reasonably priced compared to other ranges and our clay throwers are durable, high quality and maintained regularly for proper operation every time. Our shooting park offers a one-of-a-kind experience while trap shooting in Ottawa that you can’t find anywhere else in the area. Gun rentals and ammo are available and at Buffalo Range, we strive to provide a SAFE environment first and foremost. If for any reason you have any questions or comments about trap shooting in Ottawa, feel free to fill out the form to the right and an associate will respond shortly or give us a call at 815-433-2471.